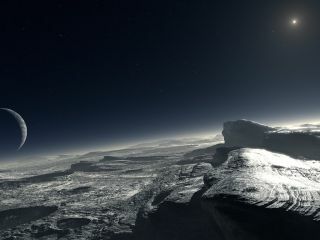 Artist’s concept of how the surface of Pluto might look. If you're confused about what exactly a planet is, don't feel bad: Astronomers are still arguing over the term eight years after the International Astronomical Union (IAU) came up with a controversial new definition that demoted Pluto to "dwarf planet" status. "Science historian Dr. Owen Gingerich, who chaired the IAU planet definition committee, will present the historical viewpoint. Dr. Gareth Williams, associate director of the Minor Planet Center, will present the IAU’s viewpoint. And Dr. Dimitar Sasselov, director of the Harvard Origins of Life Initiative, will present the exoplanet scientist’s viewpoint." At the end of the debate, the audience will get to vote on its preferred definition of "planet," and whether or not Pluto makes the cut. Results will be announced Friday (Sept. 19), CfA representatives said.